Hi There! If you're here for the Paperie Blog Tour.... Welcome!!! Thanks for stopping by! I was super excited when Amy told me she was going to start designing fabric. I met her in person a couple years ago through our mutual friend Amy. We are lucky to live closeby, so we've been meeting up ever since. I got to work with Paperie earlier when I made Amy a couple things for her booth at last year's fall market. Without question, I just had to make another quilt. I used every Paperie print as well as some solids. My favorite print is definitely Manuscript - the navy one. The pattern is Cozies Flannel. I chose this pattern because it reminds me of the Irish Chain pattern. Irish Chain is one of my favorite patterns. So simple yet stunning. I quilted it using straight lines both horizontally and vertically. I kinda love it and I'm definitely going to make this quilt again. This is also a great pattern if you are just learning to quilt. Be sure to check out other awesome Paperie projects by these amazing makers. Best part - Amy is giving away Paperie Love Letters. If you'd like to win one, leave a comment. Let me know what your favorite quilt pattern is or what you enjoy sewing / making the most. You have until Wednesday, Feb 10th, 7:00pm (PST).... a winner will be picked randomly. Again, thanks for stopping by. If you don't have Paperie yet, go get some now. It's a limited edition and once it's gone, it's gone. First to comment, wow:-) My favorite quilt pattern is Swoon and my favorite quilt blocks are those with stars. I just love them. Love your quilt it's great and stunning yet simple ... always the best combination! Paper bandana quilt by cotton and steele... It's a free pattern and oh so cute!!! I have a struggle between making quilts and making all the thing for my grandchildren!! congrats!!! My son scrolled and picked your post as the winner! Please email me your address to sunnyauh@yahoo.com. Tell your son thank you too Jenn!! I love to make all sorts of things but my go to favorites are bags and zipper pouches. I'm also working on a 1" EPP hexagon quilt made of scraps in between projects! Your quilt is stunning! Right now I am into mini's ... mini makes, mini quilts, mini totes ... basically projects I can get done in a relatively quick time. Your quilt has a beautiful mixture of solids and prints. Currently, I love sewing simple quilts. Your quilt is beautiful! I love triangles and diamonds so any pattern with those I love! Sometimes a simple equilateral triangle quilt is so lovely! Your quilt looks so soft. Lately I have been making wall hangings. I usually make lap quilts. Thank you for the inspiration. Paperie is just gorgeous! Currently trying out patterns like shortcake and framed and loving sewing and getting things finished!! Right now I'm learning (and loving) all about Half-square triangles and the secondary patterns that appear while arranging them. I don't have any Paperie , my LQS doesn't stock it, but I love seeing the fun that ya'll are having with it. I love sewing pixels (small squares). Your quilt is awesome! Thanks for the post on it. I would love to use these charm squares to make a pouch and to make some fused/appliqued Valentine postcards. At the moment I'm obsessed with hearts, pixel hearts to be more precise. 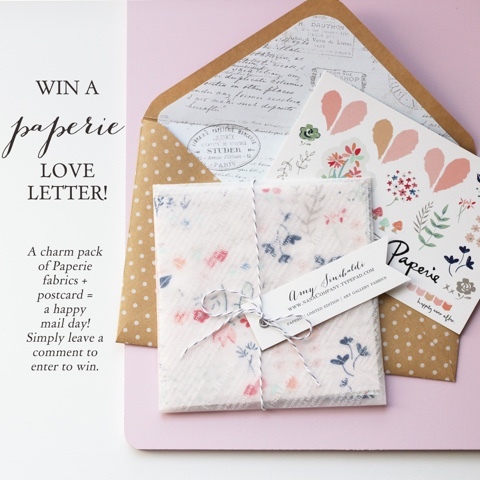 I also really want to try the quilt pattern in the Paperie look book. Right now I am just obsessed with sewing again! It feels so good to be back in my studio creating anything! Don't really have a favorite pattern, but I have made 6 different log cabins. I'm working on my first on point quilt for my 3 year old granddaughter. Her rules were that there would be no white or squares. :-). I love the Paperie collection and your quilt I'd lovely. I'm not sure I could pick a favorite quilt pattern, but I definitely enjoy making quilts the most! And I am especially drawn to that navy fabric, too! I like dresden pattern. It took me about 3 years to finish crib size (I hand quilt it). Thanks for the giveaway. It seems I my favorite is whatever I am working on at that moment but I do love a Hunter's Star and Granny Squares quilt. Your quilt is wonderful. I love your quilt! Looks like a perfect pattern for a beginning quilter. My favourite patter is the Hunter's Star. Thanks! My all-time favorite quilt pattern is the log cabin. Not very glamorous, but it is the one I return to again and again. Sunny, my favorite quick things to sew/quilt are fabric baskets, 6"X10" or a little bigger. Perfect for holding kitchen coffee pods, or notions or fat quarters in the sewing room . Cozies Flannel sounds so perfect, warm and exactly whats in order to cuddle up late night. Thank you for sharing in Paperie, what a subtle collection. I enjoy small projects : small bags. I would also like to try hexies. I love making star quilts. I don't have a favorite but I love 1/2square triangles ! Thank you. Your quilt is awesome... I would like to make it! Favorite pattern is hard--there are so many wonderful patterns available nowadays. Love how you used Paperie. Glad to find your blog! My favorite quilt patterns are ones that use HST. I love all the blocks you can make with them! It's hard to think of a single favorite so I will just go with your cozies flannel. Thanks for give away. Your quilt is great. I love these fabrics. Thanks. Thanks for chance to win your Give-a-way too! I have so many things that I like to sew and am always making something new and different. It's kind of like my cooking...I rarely make the same recipe twice. Life is too short to make the same thing over and over. I do prefer smaller quilts, like baby or crib sized just because they are easier to manage. I'm up for anything! I like to use pinwheels and half square triangles in my quilting. I also like to do FMQ on solids! My favorite thing to sew is costumes. I love being creative and using my imagination and a few raw materials to make something totally new. I love sewing things for others. Baby gifts (soft toys, playmats), pincushions, coasters. I love the log cabin pattern and might try that too with this fabric. 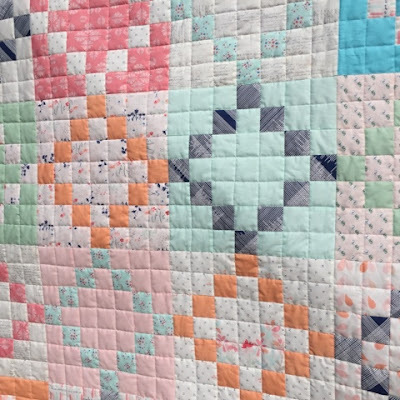 Thank you for sharing your beautiful quilt and the giveaway chance! I'm enjoying sewing my nieces a few dresses with these pretty fabrics. How pretty your quilt is. I do not have a favorite quilt pattern. I love them all and want to make them all. Ha! Not enough time for that is there? I bought some Paperie to make some wee little dresses for my new granddaughter. I think they are perfect for that. Thank you for this giveaway. I love to sew quilted bags and pouches. I am a beginner quilter too. I have many ideas for the use of this wonderful fabric, if I am lucky. This quilt is lovely. I have been into plus quilts lately. Haven't started one yet but do have the fabric all ready to go. I love sewing baby quilts because they're small and easy to make quickly. I love all the different designs that can be made using half-square triangles! I love sewing quilts, who can pick a favorite? Thanks for the chance to win! Quilts are a favorite of mine, although I haven't ventured beyond simple block patterns! 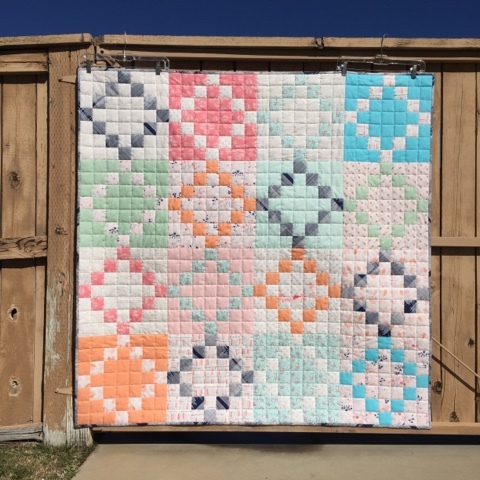 I'm really wanting to make the half heart quilt Amy put up on her blog! I like kaleidoscope quilts, and might try making a mini one if I win that Paperie charm pack! I love making bags, quilts, and little projects. Wish I had more hours in a day! I love making baby quilts for all the littles in my life! Your quilt is gorgeous! How large is each block? They look so tiny...which is a bit scary! I like sewing bags the most. Your quilt is lovely, the colours are so relaxing shich is perfect for a snuggly quilt. Love your quilt! I like making quilts of all sizes and the occasional bag or pouch. I love your quilt. I enjoy making applique quilts like Bunny Hill quilts and/or pieced "picture" quilts like Lori Holts Quilty fun quilts. My favorite part is quilting the quilt with my FMQ on my domestic machine. I am newer to quilting so I don't have a favorite mastered yet. I do love log cabin and would love to try Irish chain. Thank you for chance! Love your design with these sweet fabrics. Right now, my favorite quilt pattern to use is hexis. I love to see sweet dresses and outfits for my 6 young grandchildren especially with these gorgeous fabrics. They are so inspiring.